I suppose it’s only a matter of time before something like this is sold in drug stores. “Lose weight and build abs of steel in only 3 weeks with no dieting!” You pay $20 at the pharmacy and they let you into a back room where someone that is already sick coughs on you. I have to admit, that’s one virus I wouldn’t mind having. 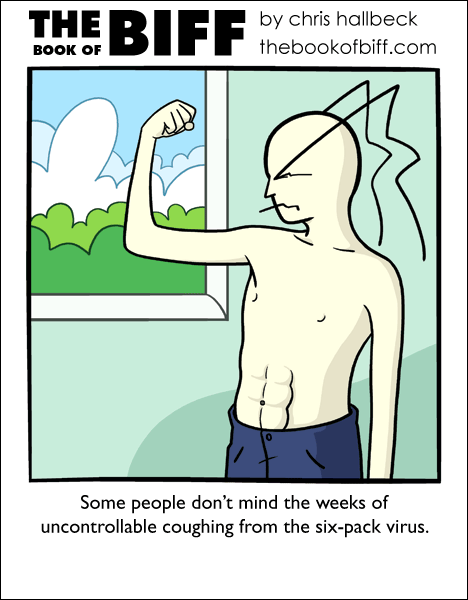 Who wouldn’t want the six pack virus? In real life people have used tapeworms to lose weight. I remember Jay Mohr on a talk show several years back, talking about how he’d just dropped 8 pounds using this new weight loss method. “It’s called the flu,” he added. Also the only time I’ve ever laughed at something Jay Mohr said. Drat, and I just had four vaccinations. …oh god a virus/sick comic week string of comics is coming, I just realized that. Any time I have the flu, I drop about 15 lbs in a week. And when I do, every one tells me I look freakishly like a walking corpse. Great, then somebody will genetically engineer a virus for the biceps… I don’t even want to think about what that will entail when you catch it. ….no way! I’m not *that* desperate! In ChemII I sit with my friends and laugh alot. I keep saying by the end of the year, my abs will be fantastic! Only thing that ever did that for me was whooping cough. Sucked at the time, but gave me the nicest abs I’ve ever had, seriously. My crazy parents skipped that vaccination for some reason, and never told me about it. Maybe they wanted me to develop abs? I’ve had that bug, though I think mine was a bacteria rather than a virus. It lead to a deep lung infection which prompted much hard, hacking coughing over the course of about a month. Abs of titanium when I got better… But my throat felt as if it had been scrubbed with steel wool. I have the lowest immune system in the world, and this comic just reminded me I haven’t gotten sick yet this school year. Great. Interestingly enough, I don’t often get sick, and I very rarely remain sick for more than three days. Despite the fact that I eat about the worst food possible. I usually don’t get sick, but the past few days I was, still am :(. That is a rather disturbing description of a possible but very unethical weight lost program. I once had a stomach virus for 3 months. I barely ate anything that wasn’t a type of pasta. I went from 235 lbs to 212 lbs. I am glad to be back to normal though. I was sick with a sinus infection. I barely ate throughout the day, but when I was hungry I would scarf down a whole box of stuffing. I just read this now, and it coincides with a sudden bout of flu in my neighborhood. I’m hoping this one gives me awesome abs.